The AAPT recognizes the role of teacher leadership and its potential for positively impacting science education. Check out the opportunities and resources below to get involved as a physics teacher leader. Applications were due by 15 March 2019. Description: The AAPT and the American Institute of Physics (AIP) seek applicants for this recently-funded fellowship, supported by the AIP Venture Partnership Fund. The purpose of this fellowship is to engage K-12 classroom teachers of physics and physical science (including elementary teachers) as agents of change in physics education. Funding will be provided for travel, meals, and accommodations (at double-occupancy) necessary for a summer workshop in Washington, DC. Following the summer workshop, participants will be expected to carry out their strategic plans for policy engagements during the 2019-2020 academic year. See the full program description and eligibility requirements here. In 2018, twelve physics educators from AZ, CA, IL, KS, NY, and SD were selected. Learn more about their stories here. 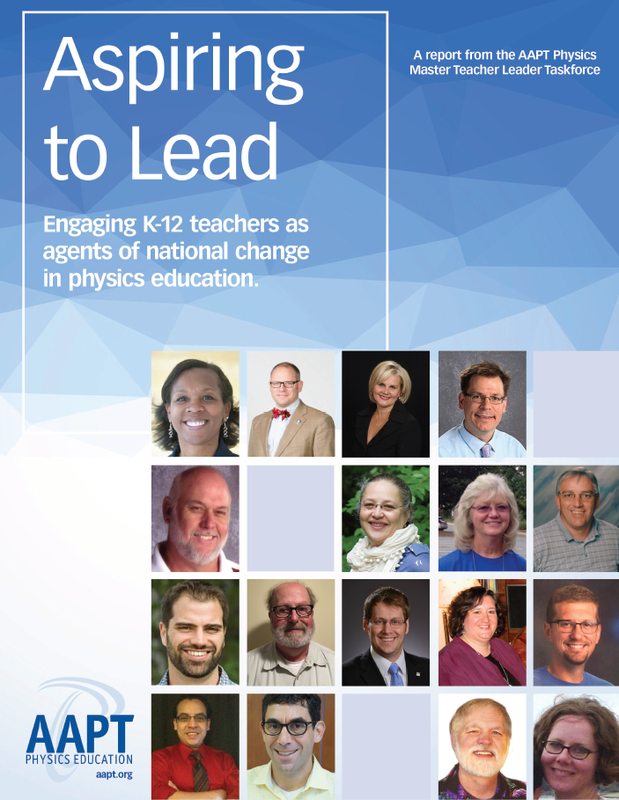 Over 43 current or prior physics teachers, including teacher educators, physics education researchers, and policy leaders, have contributed to this project since early 2016. Recognizing the need for networked physics teacher leadership to improve the quality and quantity of K-12 physics education, the AAPT selected a group of 17 Physics Master Teacher Leaders (PMTLs) supported by 13 teacher advisory members and a team of leadership advisory members.This task force was asked to develop a strategic plan to "create a new set of aspirational and coherent professional development and leadership models for the K-12 physics education community," and resulted in a major report, Aspiring to Lead. This project has been supported through a number of 100Kin10 Collaboration Grants and funds allocated by the AAPT Board of Directors. Program Design: Based upon the report, the team proposes to design three programs that address the three priority areas set forth in the report. Research Plan: These priority areas and associated programs call for additional educational research that focuses on both teacher leader network analysis, as well as contextualized studies on specific types of teacher leadership engagement. K-8 teachers in our work. Work on this initiative was funded in part by multiple 100Kin10 Collaboration Grants.